We are proud to offer an extensive range of Men's snowboard boots, from leading brands Deeluxe, Nitro, Ride, K2 and Salomon. For over a decade, this team favorite has destroyed everything in sight with the ultimate in freestyle comfort precision. Setting the bar higher season after season, this year we have introduced our new ORTHOLITE® DUAL DENSITY FOOTBED in the D3O® ENHANCED CLOUD 9 LINER for improved all day comfort. The NEW VIBRAM® OUTSOLE MADE OF VIBRAM® ICETREK COMPOUND and ARMORED SPINE provide unparalleled durability and sure foothold on and off the board. The boot of choice for riders like Eero Ettala and Marcus Kleveland, the Team is legendary for its stacked technology and comfort, with its AIR DAMPENING, FLEX LINK DESIGN, and THERMINATOR SHIELD delivering seamless support, comfort, response, and warmth day after day. 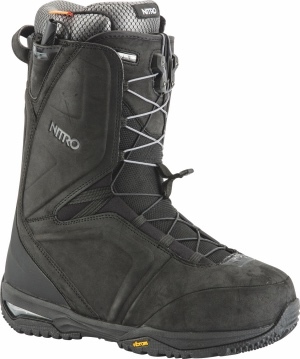 Bootfitter's comments: Nitro is a new brand for us this season, and the Team is the flagship boot in their range. Featuring a medium-firm flex, precise liner, and Nitro's proven TLS lacing system, the Team provides all-day performance and response. Generations of the best of the best fit, comfort, and performance technologies build up this bang for your buck snowboard boot. Channeling years of boot building expertise has created one of the best do it all snowboard boots, from burly AK lines to jibbing in the park, the Anthem delivers. Equipped with our surefooted RUBBER/EVA OUTSOLE and delivering dreamy comfort in our CLOUD 3 LINER you are guaranteed to enjoy every single turn, ollie, slide, slash, all year long! No matter the conditions this is the most dependable boot on the mountain. Bootfitter's comments: The Anthem packs all of Nitro's tech and boot building expertise into a medium-soft, affordable package that provides a precise fit and durable performance. Perfect for the first-time buyer looking for a boot to take their riding to the next level. Replacing the best-selling Vicious, the new Deeluxe Edge TF is a stiff, supportive boot built for high-performance carving and all-mountain riding. Boa lacing gives a dialled heel fit, while Slytech inserts underfoor give great shock absorption. Bootfitter’s comments: The new Edge TF is a great option for riders looking for a firm, responsive boot in a wider fit shape. You can count on Deeluxe’s legendary durability and the high-quality thermo liner to give lasting fit and response season after season. If you consider the entire mountain your domain, the Empire awaits you. Our flagship boot features a timeless, asymmetrical design for pushing progression. From kickers to cliffs, the Empire can handle it all. Bootfitter’s comments: Featuring a mid-firm flex, and Deeluxe’s slightly softer (but still fully custom) TF liner, the Empire is a great everyday boot for almost any rider! As Deeluxe’s best-selling boot, the ID blends a timeless design with inspired technology. A D-Lug sole features Slytech One foam for additional cushioning and a Thermo Block insulation layer. It’s also available with any of our liners and can sport an optional TPS shield. Slay the whole mountain. Bootfitter’s comments: A top-quality boot with a medium flex and a wider forefoot, the ID Team is a great option for those looking to progress their riding in comfort. Get mechanical assistance from the most responsive and supportive boot out there—The Malamute Snowboard Boot comes complete with an Integrated Heel Strap, Salomon’s Power Frame, paired with Energizer Bars that ensure a long lasting and a customizable flex pattern. A Custom Fit Pro Liner for unrivaled comfort and a convenient Power Lock Lacing system. Get even more traction and comfort with the Hike Outsole, a Ortholite C3 insole with dual density memory foam, plus an EVA heelcup. Bootfitter’s comments: A super-stiff and precise boot for hard charging all-mountain riders, the Malamute has been a favourite of ours for some time. Adjustable fit an flex allow the boot to be tuned to your needs. The Thraxis offers more on the fly fit tuning than any other boot you can buy. With three Boa® reels controlling one internal and two external lace zones there is no better way to ensure proper fit. Now with a new Vibram® outsole that is rooted in mountaineering trade tradition the Thraxis is next level snowboarding footwear. Bootfitter’s comments: Triple Boa for ultimate fit tuning, the Thraxis is light, stiff and comfortable to keep you on the mountain all day. Fit and long lasting consistent flex has not only earned Tim Eddy’s trust but also that of most snowboarders around the globe. Now more then ever, the Maysis snowboard boot is the best choice in Double Boa comfort and shred performance. Bootfitter’s comments: Double Boa adjustability and an Intuition liner for a dialled fit, the Maysis is an awesome option for those looking for no-nonsense all mountain performance. Bootfitter’s comments: Brand new for this season, the Boundary features precise dual Boa lacing, a rugged outsole and a versatile, medium-firm flex for fit-and-forget performance all over the mountain. Bootfitter’s comments: An uncomplicated, lightweight boot, the Ryker is a great option for first-time buyers looking for a dependable option to take their riding to the next level. No need to adjust your meds, the Insano will take you to new levels of crazy with proven performance features and the latest in lightweight goodness. The Insano features the premium fit of our Intuition™ Dream Liner and Boa® Focus lacing with the Closer™ lace guide, along with the ultra-premium Michelin® Peak Sole for a barefoot light feel. Offering first-class function and a precise fit, this charging snowboard boot commands on hill respect. Bootfitter’s comments: Serious performance and durability from Ride. The Insano fits that little bit snugger than a lot of competitors, giving awesome heel hold and instant response from your board. Tired of constantly having to readjust your boot fit after every run? The Ride Deadbolt Focus Boa Snowboard Boots are designed to keep things on lock down. The Tongue-Tied Boa Closure System fastens every area of the boot in nice and tight so you can get the max amount of response out of this stiffer-flexing boot. The Boa Focus Closure gives a precise fit in both the upper and lower areas of the boot, and the Tongue-Tied system adds exceptional heel hold. Don't confuse the Deadbolt's snug fit for being uncomfortable, as the Intuition Mobile Foam Wrap Liner builds seamless comfort and ability right into the boot using heat-moldable dual-density foam. The boot's sole is sturdy and supportive, with a Michelin Fiberlite outsole for easy hiking and a +Slime midsole for all-day comfort. The Ride Deadbolt Focus Boa Snowboard Boots have it all for the all-mountain rider who wants total performance and comfort. Bootfitter’s comments: A brand new boot from Ride this year, the Deadbolt features a precise, performance-oriented fit and medium-firm flex, making it a great option for good riders looking for one boot to rule the whole mountain.